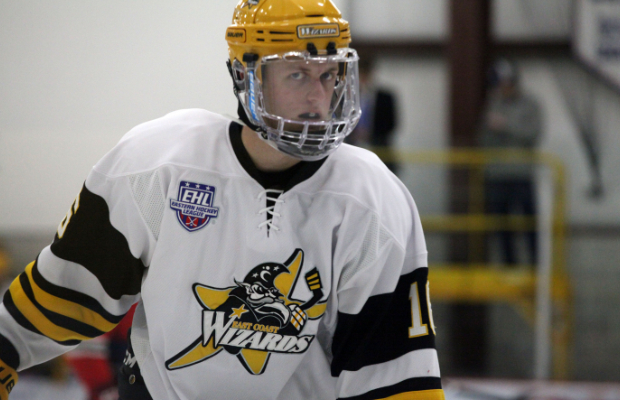 NEWINGTON, CT -- The East Coast Wizards jumped out in front and then held on at the end, as they got back in the win column with a 5-4 victory over the Connecticut Chiefs. With the win this afternoon, the Wizards improved their record up to 9-6-1 for the season, and grab some momentum heading into the November Showcase. "This was a good one for our group," said Wizards head coach and general manager Freddy Meyer. "We had a similar 3-goal lead last week in Philly, and learned the hard lesson of competing for the full 60 minutes. The Chiefs began to battle back in this one, but I was happy to see our guys stayed focused until the final horn." The opening period featured a pair of goals, both for the road team, as Steve Rizzuto and Gabriel Gagnon each found the back of the net. The Wizards were feeling good on their way to locker room, up 2-0 on the scoreboard and outshooting the Chiefs 10-3. However, the middle frame started off in a much different fashion, as the Chiefs cut into the deficit right away. The game stayed 2-1 for a majority of the period, until Isaac Leslie made it a 2-goal game once again, with 3:10 left to go before the break. The shots in the 2nd period were closer, with the Wizards leading 9-6 in this category. The 3rd and final period was easily the most exciting, as the 2 teams combined for 5 goals. After Connecticut scored just over 2 minutes into the frame, Skylar Pettingill and James Nash had the next pair of tallies for the Wizards, stretching the lead out to 5-2. Both of these goals proved to be very important, as the Chiefs got to within 2 goals with 2:02 left, and then made it a 5-4 game just 15 seconds later. Ultimately the Wizards were able to hang on, and breathed a sigh of relief when the final horn sounded. Kevin Dacey and Korbinian Lutz split the game between the pipes, combining to stop 15 of the 19 shots the Chiefs put on net. Coming up next for the Wizards is the November Showcase, and matchups against Team Maryland (Sunday) and the North Carolina Golden Bears (Monday). Skylar Pettingill ('99) scored his first career EHL goal in Wednesday's 5-4 victory over the Connecticut Chiefs.